After a long and storied career in battle rap, it's all coming to an end today, as Arsonal Da Rebel prepares to face off with fellow battle legend Loaded Lux in the main event of U Dubb's "Alpha N Omega." The event will have a Newark vs. Harlem theme, with some of the best emcees from their respective areas doing battle for regional supremacy. Despite that, for those expecting to see the disrespectful Arsonal, I’m not actually sure that’s what we’ll see from him. Lux is someone not only that Ars respects, but all indications are, that he views him as a mentor. Given the infrequency with which Lux battles, every time his name gets announced, with it comes with a ton of anticipation, and more often than not, he delivers when he hits the stage. One of the best rappers in battle rap, as well as one of the most respected writers, Lux is a challenge for any man who stands in front of him. Simply he is one of the best and most talented rappers the scene has ever produced. If Arsonal wants to go out with a classic, there really can be no better choice than Lux, who in just 4 battles in the modern era has not only one of the best battles in history vs. Hollow Da Don; but has perhaps the most iconic performance in battle history, against Calicoe. With this being Ars' last battle, on his home league, against someone he respects, and Lux wanting to make every performance he has a memorable one, we have the makings of an absolute classic. In what should be the most aggressive battle of the night, King of the Dot champion Head I.C.E faces off with Newark top tier vet Shotgun Suge. This will be the first battle since Ice took the chain, and in this battle he's not just representing himself, but he will go as the representative of KOTD, so there's a lot riding on him performing to his usual standard. Not that that should be a problem for him. Ice is one of the most consistent battlers in the culture, always coming with a powerful showing. If there is any battler that Ice will have difficulty overpowering it's without question Shotgun Suge. In addition to his aggressive delivery, Suge's battles often cross over into being actually physical. Against battlers who are easy to intimidate, Suge is able to throw them off their game, but with Ice being a veteran in battle rap, he isn't likely to be effected. This matchup is about two guys who will want to do similar things, and the winner will be who can better implement their game plan. 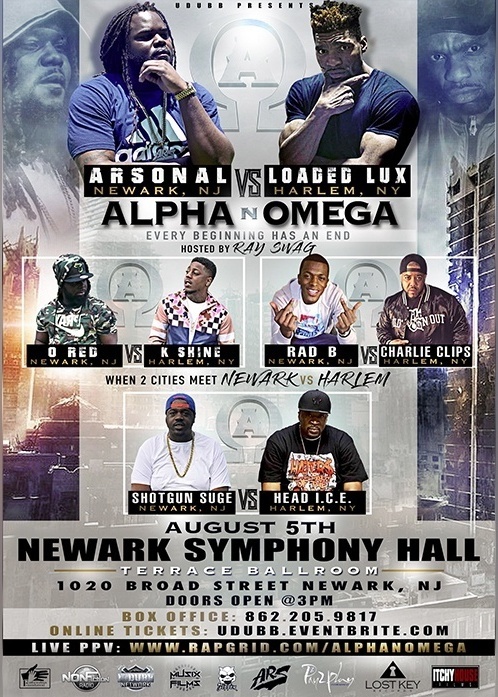 At Alpha N Omega, O-Red will return to the stage he hasn't competed on since his solid battle against Hitman Holla at the original High Stakes. Red has generally shown up for battles on this stage, and has been home to some of his finest showings. Shine is Shine no matter what stage he's on. He's going to show up, do his thing, have a strong outing and raise his stock. Despite the fact that K-Shine has been in the game as long as almost anyone, he's still as hungry as when he first started and every event seeks to solidify his place in the culture. If Ars and Lux aren't at the top of their games, this is the type of battle which could overshadow them, and could end up being Battle of the Night. The final two battles on the card are very similar as they involve Newark up-and-comers facing off against Harlem legends. For Jai 400 Block and Rad B, facing off against T-Rex and Charlie Clips respectively is a huge opportunity for them, for if they can take clear wins against the legends, their stock will rise exponentially. 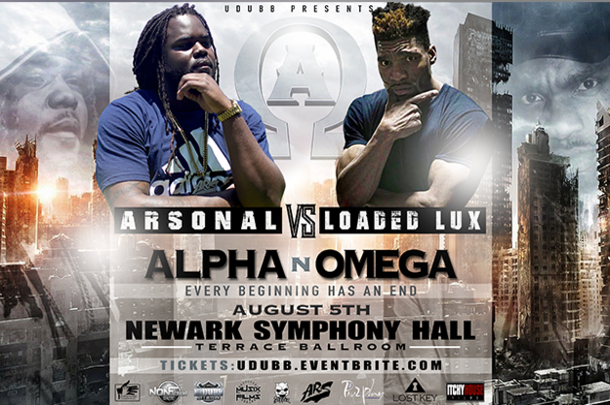 The event goes down August 5 in Newark and has a live PPY available here.